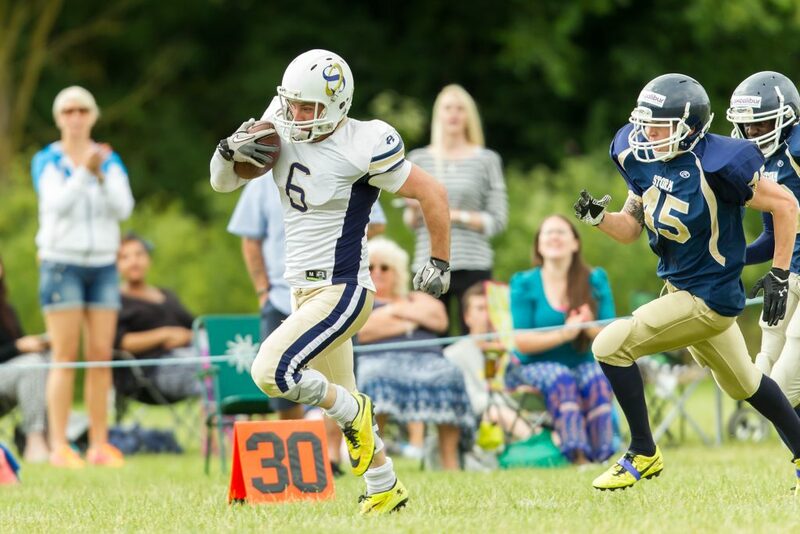 On SUNDAY 5th July, head coach Andrew Day and the Oxford Saints dealt a huge blow to local rivals the Swindon Storm, whilst booking a place in the 2015 playoffs. Earlier in the season the Saints came away with a 50-16 loss against Swindon, but this time the tables were turned and Oxford put on a dominating performance. Not only was it the first time Oxford had beaten Swindon in a regular season fixture, this game also saw a number of other changes on the field. 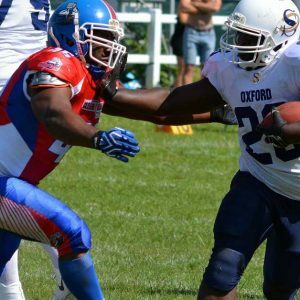 Rookie defensive tackle Dann Harvey was awarded with his first starting position and performed well, alongside 2nd year safety Chris Fox who also earned his first starting position with the Oxford defense, going on to be awarded ‘Defensive MVP’ of the game. 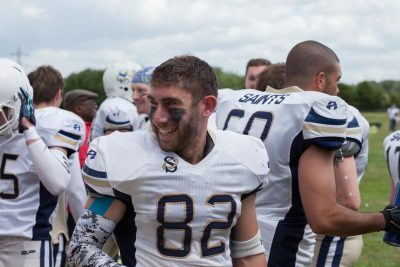 The Saints also welcomed the return of veteran cornerback Jonny Dover, who took to the field for the first time this year after being deployed to the Falklands with the Armed Forces and missing the majority of the season. A special guest at the game was former player and retired coach Maurice Coleman, who joined the team when it first began in the 1980’s. Coleman entered the pre-game huddle and motivated the team with a rousing speech, noting the many new faces in this growing and promising team. Now sitting on a 5-2 record, the Saints are 2nd in the Southern Football Conference West , just behind Bristol, and have now guaranteed themselves a spot in the division II playoffs. In Oxford’s last home game of the regular season and with a large supporting crowd, the Saints received the kickoff and began with the ball. First year quarterback Ben Denton led the offense onto the field who quickly found their rhythm with two break out runs from running back Kev Brooks, picking up 35 yards. Strong running from Brooks and James Walter brought the Saints close to the endzone, with Grant Tebb charging in for his first score of the day. Spencer Duffy attempted the extra point kick but it was blocked by a towering Swindon defender. 6-0 Oxford. With a quick score on the board, confidence was high and the Saints defense took over. 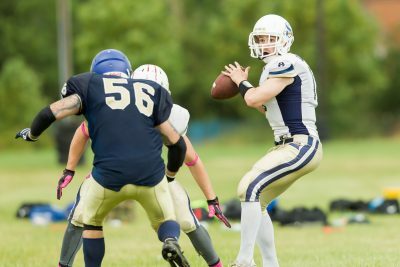 Swindon quarterback Greg Roscow led his own offense onto the field, coming off a 78-34 victory last week over the Torbay Trojans. In that game Roscow had an impressive performance throwing for 300 yards and 5 touchdown passes. 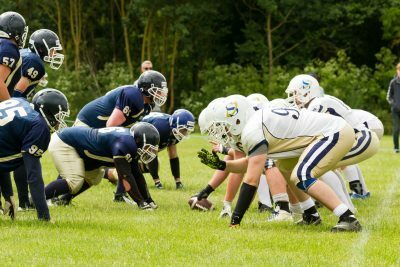 Swindon also set out to establish their run game but faced a tough Oxford defense, who knew the main threat from Swindon would come from sweep plays and reverse plays. The defenders worked hard to contain these outside threats. After several run plays the Storm picked up a first down followed by a 9 yard completed pass. Roscow looked to pass the ball again but both attempts fell incomplete, forcing Swindon to punt the ball away. 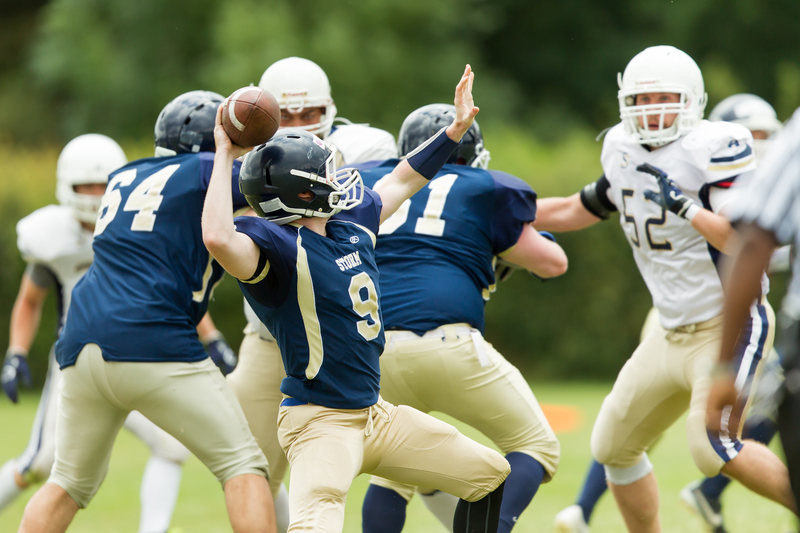 The Saints offense returned to the field but the drive was cut short after just two plays, when a pass attempt from Ben Denton was intercepted by a Swindon defender. 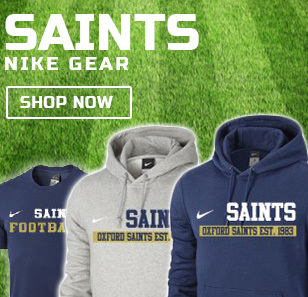 The visitors looked to capitalise but strong play from safety Chris Fox, making his first start with the Saints defense, and an 8 yard tackle for a loss by safety Martin Fitzpatrick, ended the Swindon drive and forced another punt. 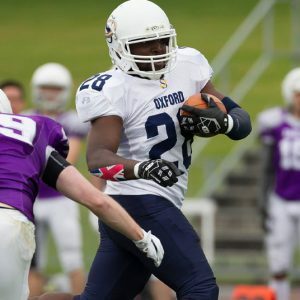 Oxford took over from their own 16 yard line and had a long distance to travel, but impressive running from the unstoppable James Walter quickly covered the distance. Walter charged through his opponents and picked up 32 yards in two plays, before a huge run for a 52 yard touchdown. 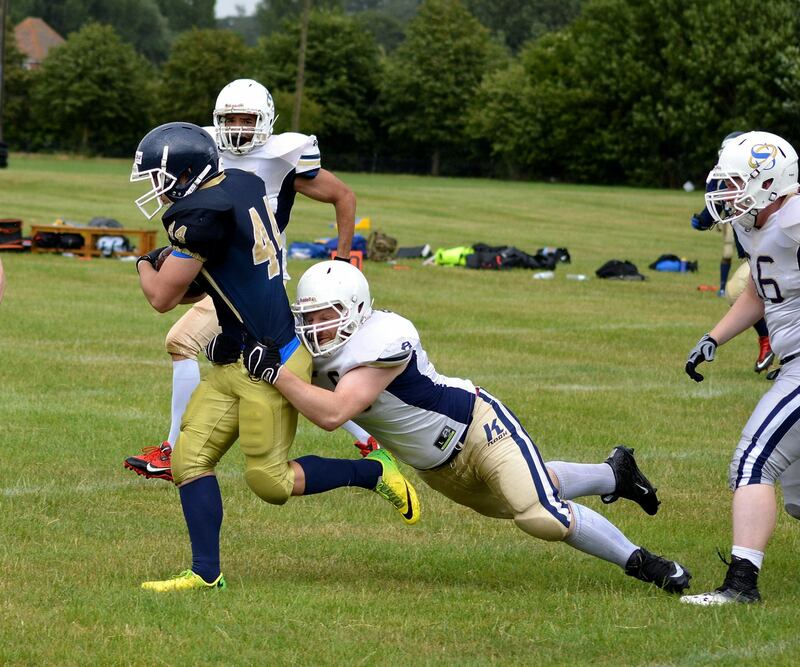 With Swindon unable to bring him down, Walter broke through several tackles and charged into the endzone. Duffy attempted the extra point but it was again blocked, 12-0 Oxford. 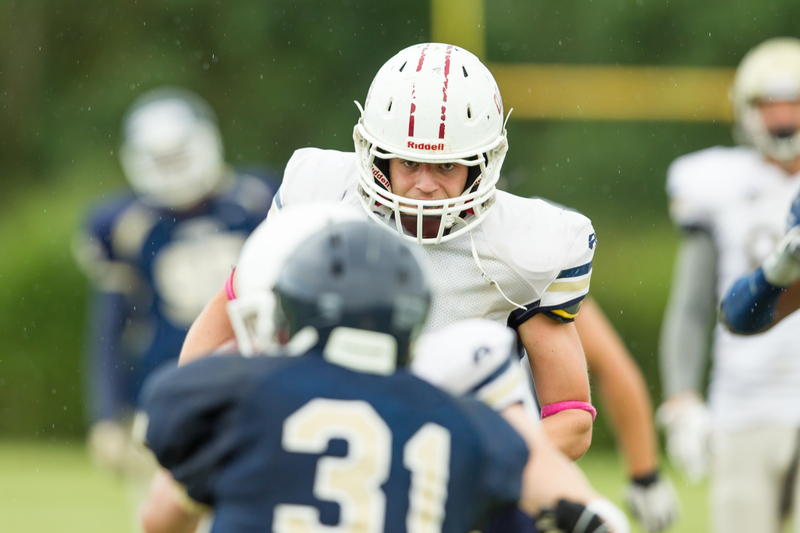 Swindon answered back quickly with a 66 yard touchdown run, leaving the Oxford defense stunned. Roscow handed the ball to Luke McEnroe who ran straight up the middle of the field and avoided the Saints defenders in pursuit. McEnroe kicked the extra point himself and it went through the uprights, 12-7 Oxford. The Saints looked to return the favour and kept the ball on the ground. Attempting to pick up gains on the ground, Brooks and Walter were unable to break through for any significant yards. Full back Ryan Kingshott picked up a few extra yards up the middle before bringing up an incomplete pass attempt on 3rd down. 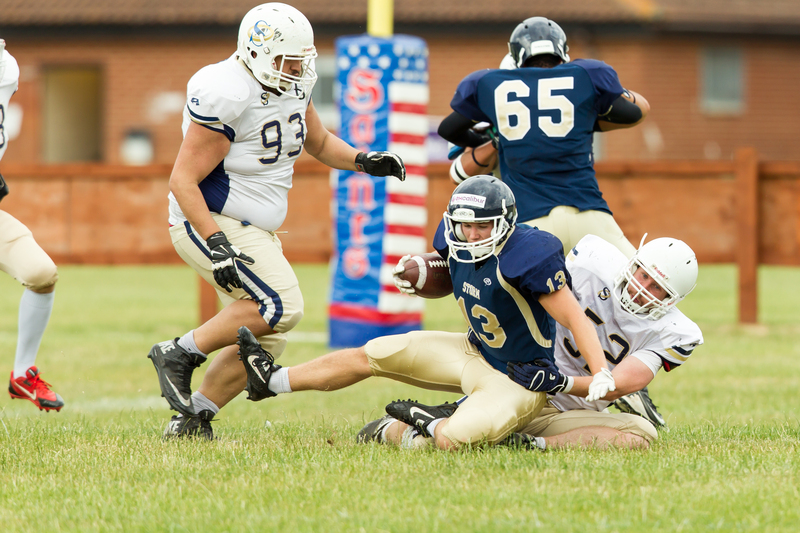 Oxford punted the ball away for the first time and Swindon’s offense took over from their own 33 yard line. The 2nd quarter began with neither side able to deliver a productive performance on offense. Roscow handed the ball off but the runner was tackled by rookie defensive tackle Dann Harvey, who was making his first appearance as a starter with the Saints defense. Two incomplete passes followed before Swindon punted the ball away, and Oxford’s following drive also ended in a punt after failing to pick up a first down. With Swindon’s offense on the field, the Oxford defense stated their dominance with tackles from Toby Durant and Graeme Taylor who brought down the Swindon runners for a loss of yards. One of the key plays of the game came on 4th down when rookie defensive end Sam Stancombe landed a huge hit on Roscow from behind, sacking the young quarterback for a 9 yard loss. Stancombe suffered a serious injury during pre-season training and this was his first game back with the Saints. His recovery and rehabilitation work paid off, earning his first career sack with his new team. The sack from Stancombe caused a surge in morale on the Oxford sideline, as Denton and his offense took to the field. 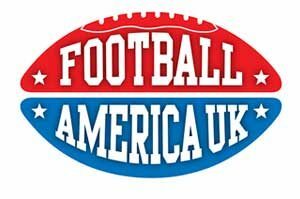 The ball was handed to Walter who picked up 7 yards, before Denton threw a quick pass to Grant Tebb who showcased his talent with a 63 yard run into the endzone, evading the Swindon defenders who attempted to bring him down. Following the huge run, head coach Andrew Day called for a 2 point conversion attempt. Denton dropped back to pass and hit tight end Rich Bloomer in stride as he charged across the goal line and smashed a defender into the endzone at the same time. 20-7 Oxford. Swindon kept the ball on the ground in their next drive, hoping they could repeat the successes they enjoyed when they last played Oxford and dominated in the ground game. The highly experienced Saints defense continued to stand firm, with tackles from veteran defensive end Adam Baker and veteran linebacker Dean Bryan. 5 yards short of a first down, Roscow handed the ball off again but the ball carrier was brought down by rookie linebacker Connor Day for a 4 yard loss, forcing another punt. With time running out in the first half, Oxford looked to add another score onto the board and extend their lead but fell short. Walter took the handoff and ran for 11 yards, before catching a pass from Denton and picking up a further 26 yards. After the reception, Walter continued running and showcased his brute strength by fighting off a Swindon defender and launching him into his own teammate, knocking them both to the ground as the first half came to a close. 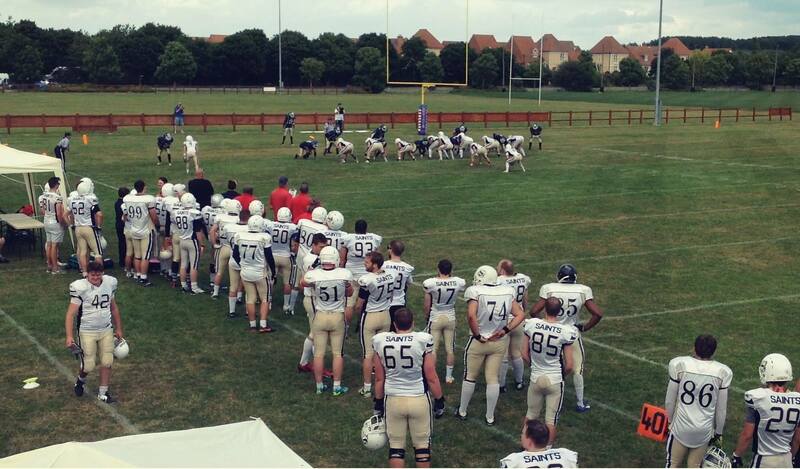 After a freak rain storm sent spectators running for cover during the half time break, the sun came out and Swindon’s offense took to the field. Keeping the ball on the ground again, Roscow continued to hand it off to his running back. Spencer Duffy in at linebacker took down the ball carrier after 6 yards and on the next play he took the runner down again for a 2 yard loss. On 3rd down Swindon fumbled the ball but they were fortunately able to dive onto it in the backfield and recover it to maintain control, resulting in a 8 yard loss. With Swindon’s offense still struggling to find it’s form, they were forced to punt again. With momentum on their side, Oxford’s offense were inspired by the strong defensive performance of their teammates and looked to increase the tempo further. Denton handed the ball to Walter who picked up 20 yards and a first down on two carries, before a completed pass to Rich Bloomer for a further 7 yards. With the endzone in sight, the ball was again given to Walter who charged into the endzone for his 2nd score of the game. Attempting another 2 point conversion, the pass fell incomplete. 26 – 7 Oxford. On his next drive, Roscow dropped back and attempted to pass but was brought down behind the line for a 5 yard loss, with Spencer Duffy claiming the sack. A run attempt followed which was stuffed by Graeme Taylor for a 3 yard loss. Facing 3rd and 18, Swindon ran the ball again and picked up 12 yards on the ground before cornerback Ian Hiscock brought down the runner, forcing another punt. On the following drive Denton took over on Swindon’s 27 yard line with short distance to the goal line. He looked to pass but targets to Leroy Holmes and rookie Thomas Swift fell incomplete. The ball was handed to Tebb on 4th down but he was unable to pick up the first down, forcing a turnover and bringing Roscow back onto the field. Roscow immediately looked to the passing game which was yet to get going and attempted a deep pass down the sideline, which was batted down by cornerback James Dunstan. Dropping back to pass again, Roscow attempted to hit his receiver on a short route but it was also knocked to the ground by Dunstan, missing an opportunity for the interception. On 3rd down the quarterback looked to the other side of the field and his pass was intercepted by veteran safety Ali Galbraith. 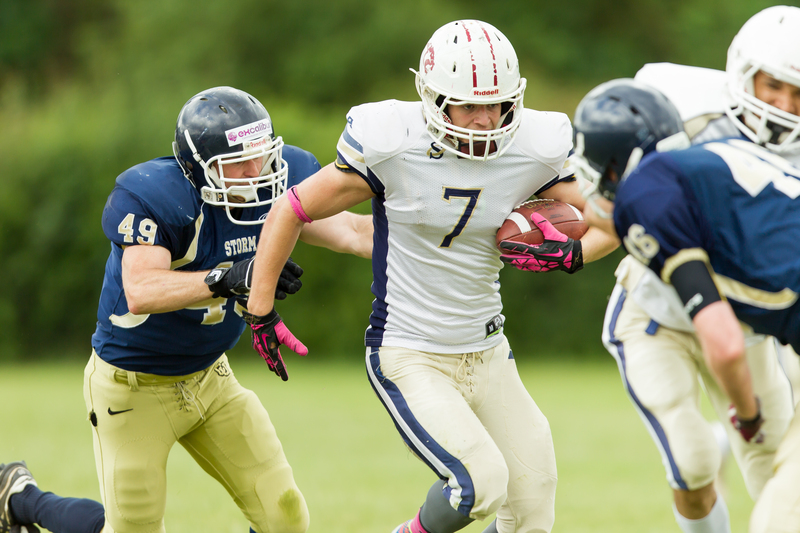 Taking over on Swindon’s 34 yard line, Denton and the Saints offense had another great shot at the endzone. The ball was first given to Brooks who picked up 8 yards on two carries, followed by a penalty on Swindon which awarded the Saints a first down. 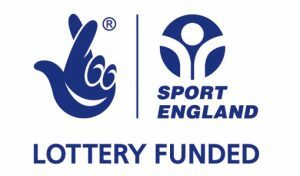 Unable to capitalise on the field position, an attempted pass to Bloomer on 4th down fell incomplete and the ball was turned over to the Storm. 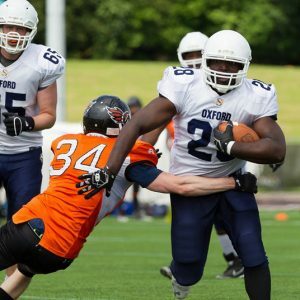 With the 3rd quarter coming to an end, Swindon were still struggling to get out of their own territory and the intimidating Oxford defense continued to control the game. An incomplete pass was followed by a sack on Roscow from Adam Baker, bringing him down for a 1 yard loss. A run for 6 yards was then brought to the ground by Duffy, forcing another Swindon punt on 4th down. As the final quarter began, Oxford’s offense took over from their own 47 yard line. On the first play Denton hit rookie receiver Tom Swift over the middle of the field for a 26 yard completion, marking the young receivers first catch with the Saints. Following the big gain, Denton targeted Swift again in the corner of the endzone but it was incomplete. Brooks and Walter picked up 8 yards but a penalty on Oxford cost them another 5, setting up 4th and 7 yards to go for the first down. Denton handed the ball to the powerful full back Ryan Kingshott, who blasted his way through the Swindon defense for a 14 yard gain. The rest of the drive was all Kingshott, as he carried the ball another 3 times before charging into the endzone untouched. Going for another 2 point conversion, the ball was handed to Bloomer who ran it around the edge of the defenders before leaping into the endzone for the extra points. 34 – 7 Oxford. Swindon finally found relief on their following drive when Roscow handed it to Robert Leaper on 2nd and 5, who sprinted through the Saints defense and up the sideline for a 60 yard touchdown run. The Storm then fumbled the ball and were unable to pick up the extra point. 34-13 Oxford. Nearing the end of the 4th quarter, Swindon were on the attack again and Roscow threw a quick pass out to his wide receiver, who was immediately brought to the ground by rookie cornerback Joseph Limerick for no gain. The Storm then started to move the ball well on the ground, picking up two first downs, with both runs being brought down by safety Chris Fox. 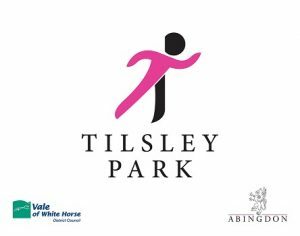 Following two incomplete pass attempts, Roscow handed the ball off again but the runner was stopped by safety Ali Galbraith for just a 5 yard gain. Swindon went for it on 4th and 5 looking to get the first down, but the ball carrier was promptly stopped in his tracks by Dann Harvey for no gain, forcing the turnover. Denton then put together a final scoring drive which was all Walter, as he took the ball each time and continued to find running space against a tiring Swindon defense. After picking up 23 yards on 4 carries, Walter then broke out for a huge 32 yard touchdown run, shaking off multiple tacklers who were desperately trying to bring the powerful running back down. Denton handed the ball to Kingshott for the 2 point play, who charged through and picked up the extra points. 42-13 Oxford. With time left for one more scoring attempt by Roscow and the Storm, the quarterback hit an open receiver in stride for a 17 yard gain, before being brought down by cornerback Ian Hiscock. An 8 yard run was stopped just short of a first down by Chris Fox, who remained on top form throughout the game. Looking to pick up the 2 yards needed for a first down, the ball carrier was brought to the ground for a 4 yard loss by rookie defensive end Graham Henley. For the final play of the game, Roscow received the ball and dropped back to pass but was instantly ran down and sacked for a 7 yard loss by rookie linebacker Matt Kersey, earning his first career sack with the Saints and resulting in Roscow’s 4th sack of the game. 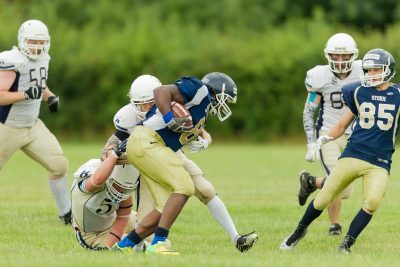 The experience and passion of the Saints paid off, as Oxford earned payback for the 50-16 loss against Swindon earlier in the season. The Storm played aggressively to the end but appeared to have a smaller squad then last time and no doubt suffered against the strong 50+ Oxford side who were able to rotate in players throughout the game. With a great home crowd, the Saints last regular season game at home was a terrific result. 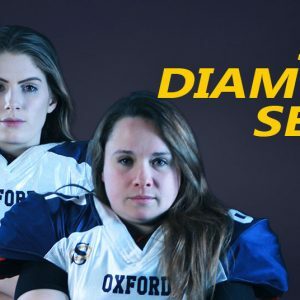 The coaching and club staff have worked tirelessly this season to deliver a competitive team for Oxford and a location where players can learn and develop their skills, regardless of experience. With rookies earning considerable game time, the battle for starting spots remains fierce with changes often being made each week to reflect individual performances. Grant Tebb scored two touchdowns on Sunday and is having a remarkable first year with the Saints. 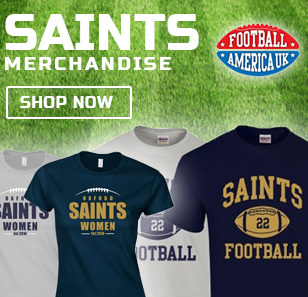 Earning their 5th victory of the season, the Saints have now booked a place in the 2015 playoffs. Game film from Sunday is already being reviewed and the team have a week of training before travelling to the Cornish Sharks to play the last regular season game on Saturday 18th July. 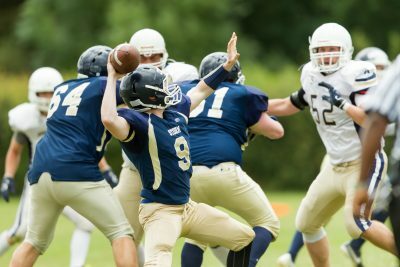 A dominant game for Oxford’s high powered offense who moved the ball with ease against Swindon, picking up 325 yards on the ground and a further 122 in the air. 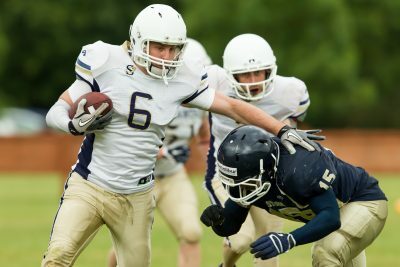 Swindon broke out two big runs for scores, contributing to their 211 yards on the ground whilst only managing 26 in the air against an experienced Oxford secondary unit. 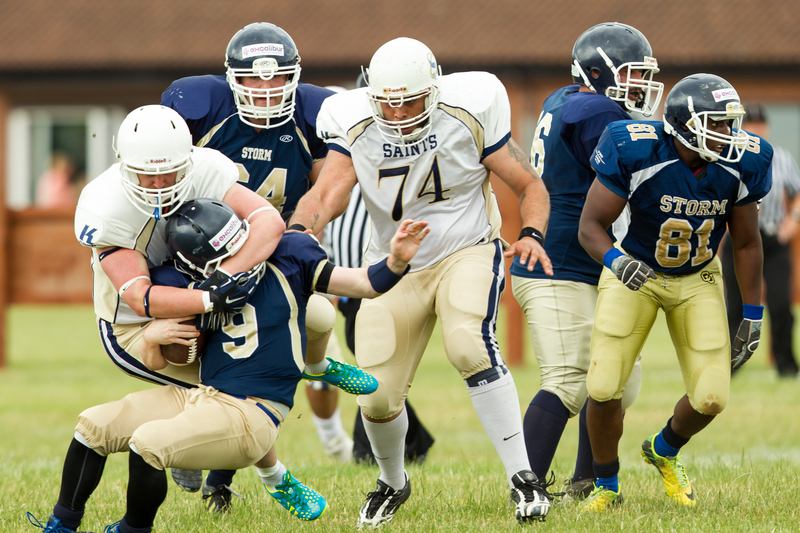 The Saints picked up 5 TD’s on the ground and one in the air, with both Storm scores being on the ground as well. Oxford’s Ben Denton attempted 14 passes and completed 5, with one interception and a TD pass to Grant Tebb. No sacks. 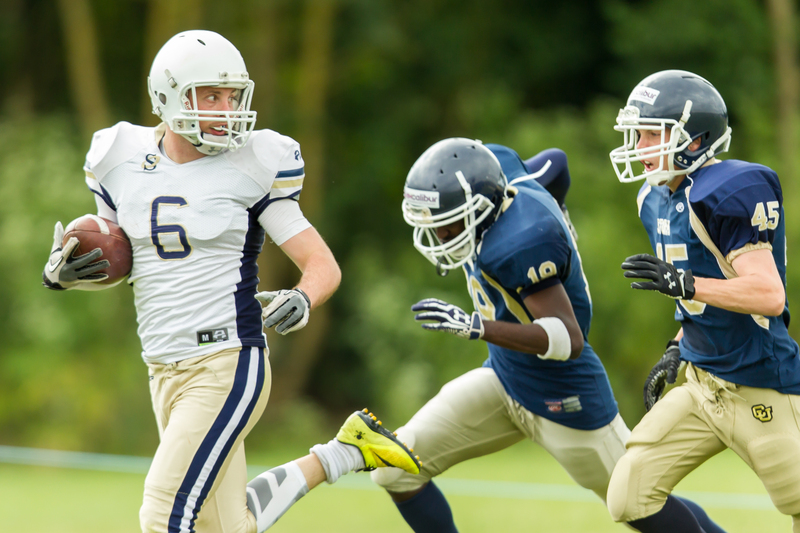 Swindon’s Greg Roscow attempted 15 passes and completed 3, with one interception and no TD’s. Roscow was sacked by the Saints defense 4 times for a total of 22 yards. 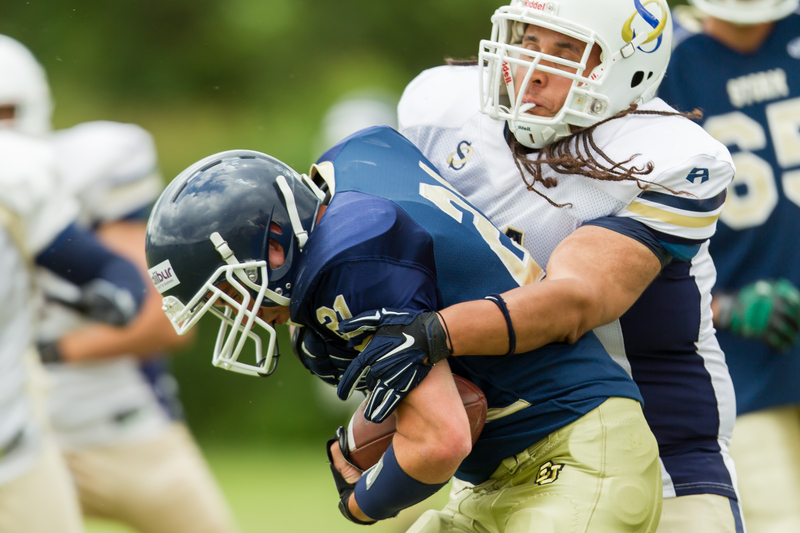 Running back/tight end James Walter put in another strong performance and remains a fierce opponent to deal with. Walter took 22 carries for 219 yards and 3 TD’s, with an average gain of 10 yards per carry. He also caught 2 passes for an additional 26 yards. Running back/tight end Grant Tebb continues to enjoy a brilliant first year with the Saints and a perfect complement to Walter. Tebb took 6 carries for 34 yards and 1 TD, with an average gain of 5.7 yards. He also caught 1 pass for a 63 yard gain and a further TD. Tebb also returned 3 punts for 101 yards. The defense put in a strong shift across the board and remained a force to be reckoned with throughout. Both Swindon scores came from two break out runs, rather then sustained drives across the field. Safety Chris Fox claimed led the day with 5 tackles in his first game as a starter, followed by linebacker Spencer Duffy with 4. Dann Harvey also claimed 2 tackles in his first game as a starter. The defense claimed 1 interception, caught by safety Ali Galbraith. Photos courtesy of Jamo’s Pics and Gareth Brown Photography have been uploaded. Check out their excellent work below.